Striving to Abide in Christ: My new puppy, Sugar! This is my new puppy, Sugar! Isn't that a sweet name? :0) We needed something white and sweet! She is a little doll. 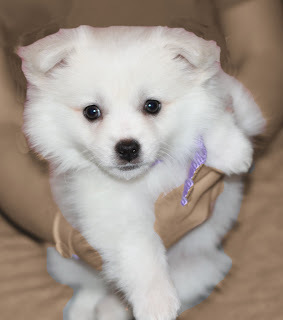 She is an American Eskimo. As it turns out we may never need to buy dog food for her as she really enjoys her place under our dining room table! She will grow into her job quite well. Congratulations on (Your) OUR new Baby!